Pregnancy is a normal condition during which a woman nurtures another human life, that starts as one cell formed by a man’s sperm cell and a woman’s egg, for 9 months. While it is a normal condition and something any married woman looks forward to, pregnancy brings along with it changes (which are normal) to the woman’s body. 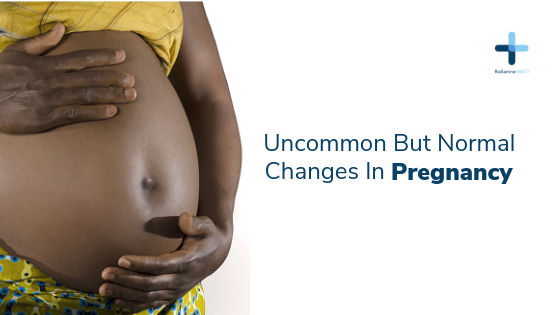 Some of these normal changes are not common and so may look abnormal when they occur in some women especially those who are pregnant for the first time. Some pregnant women may experience a very severe form of vomiting. This is characterised by frequent vomiting which leads to excessive loss of body water in the woman (dehydration). It may require the woman to be admitted to a hospital where she can be given fluids (drip) to replace the lost body water in order to avoid kidney injury from the dehydration. In some cases, severe vomiting in pregnancy may be a sign the woman is carrying more than one baby in the womb. It can also be an abnormality called a molar pregnancy: the fertilised egg in the woman’s womb didn’t develop into a baby but a lump of abnormal tissues resembling grapes clumped together, and this can fill the whole womb if not detected early. Due to the increase in hormonal levels during pregnancy, some pregnant women may notice an increase in growth of their body hair or facial hair (sprouts of hair around the jaw, looking like a beard). This, however, is likely to occur in women who are naturally hairy. Some pregnant women may also begin to feel tightening but painless sensation around their tummy starting at 7th month in those who are pregnant for the first time. In subsequent pregnancies, the tightening sensation may start earlier than 7 months. Women who experience this are advised to engage in walking and some other mild exercises which have been shown to relieve any discomfort it may cause. A lot of women who are pregnant for the first time may feel anxious if they experience any of these uncommon changes because their female friends or mothers never told them they experienced something similar during their own pregnancies. This is why a good preconception care, which will include counselling on possible changes to expect in pregnancy, and a comprehensive antenatal care are very much recommended for every woman who is looking forward to having their own baby.